Stumbling Over Chaos :: Could the non-knitters stand behind the knitters, just in case the knitters pass out from shock? Could the non-knitters stand behind the knitters, just in case the knitters pass out from shock? Thanks. Let’s try to blog safely here and minimize injuries, shall we? Yes, ’tis true – after over two months, I have finally finished the socks I started at Brigitte’s house while I was on vacation. At last! 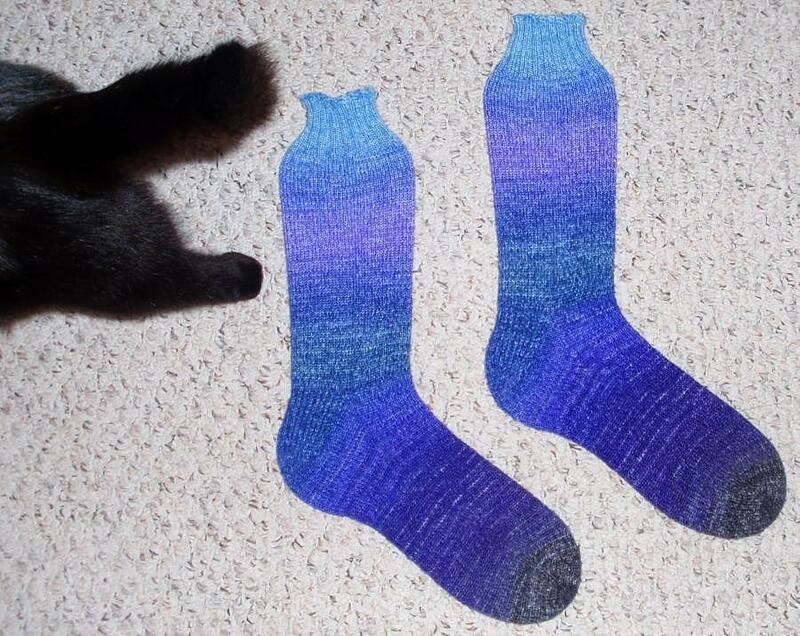 Allow me to present you a cat-free picture of my gradient socks! 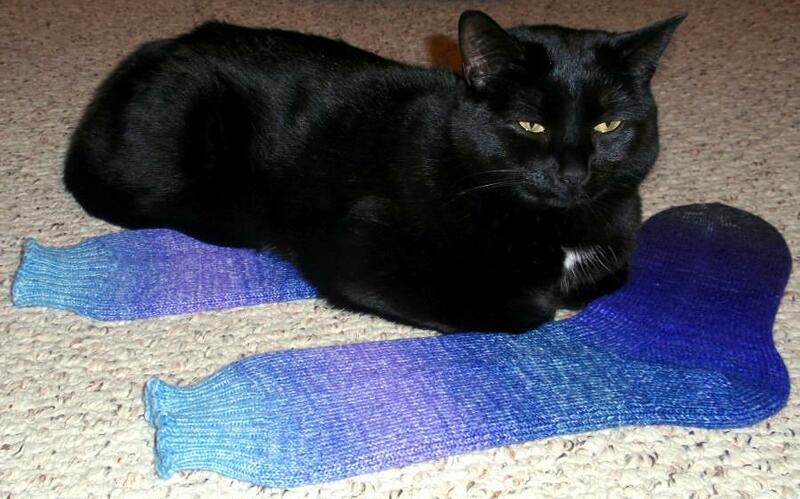 Posted by Chris on Monday, November 23rd, 2009, at 3:00 am, and filed under Knitting. Ooo! I like them! So, what do we get for an encore 😉 The black cardigan? Oooo! It’s the Toronto Socks! They turned out great – you matched up the colours perfectly! Thanks for the warning. They are lovely, but knitting??? WOW!! But she graces your knits so beautifully and blue is her color! Go May! You knit the best socks Chris!!! They are so pretty. 🙂 May, I’d be laying on those too. I love the gradient color! It’s awfully nice of you to be prepared for accidents in case of fainting knitters … and, good thing it wasn’t the other way around, because knitters usually have pointy sticks in their hands! 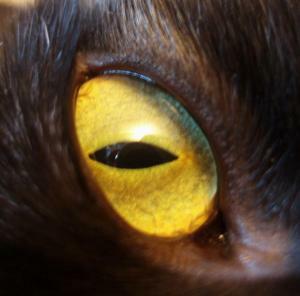 Cat-free pictures? Surely you jest. Oh, very nice socks! Love the matching gradient colours! Yea… May wondered away because she saw all those white things in the corner… hee hee!!! 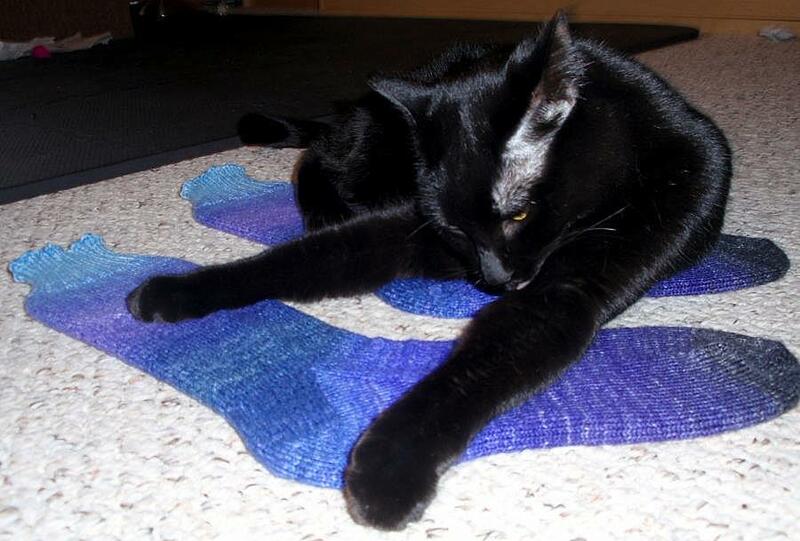 Yarn is not so fun when it is made into something MOM!!! Hope you had a great weekend and a wonderful Monday! Very cool socks! Great job matching the gradients on each. Mayhem seems very pleased to finally have socks to pose on again. I really love those socks!!! You got the gradiation down well, and you have them matching. Hard to do with graded yarn…. Woo hoo for warm feet! Lovely socks. Chris- Maybe you were thinking subliminally about the Toronto Maple Leafs when you started them. Lowest ranking team in the NHL- THAT’s something to be proud of! I really like the color variations. Great looking socks. The color is beautiful. I thought I was prepared but OMG!!! Finished PAIR of socks! !/fans self. Those are lovely. Such a great shade (well, shades) of blue! I like the shades of blue you used and they look so soft. Well done! Well regardless of how much time they took, they look beautiful. Cats do have to lay on everything don’t they. My dad’s printshop cat, Pica, had to lay on/in every box that came in and went out of the printshop. The customers just got used to a little Pica fur in their printing. I’d say something about you having a FO but I don’t have room to talk. 🙂 They’re gorgeous socks! The gradients even match. Well worth the wait. A perfect pair, Chris! And there’s something of a harrumph in that departing fluffy tail. They look great! And I love the feline involvement. They are gorgeous. Now I will slump back into a faint. I tried to do this morning, but bloggy did not like me. So. How did you get those socks so matchy? The most matchie-matchie gradient socks I have EVER seen!! No wonder they took so long. You made them match perfectly! Great socks! I love how they completely match. BTW, I didn’t faint when I saw that you’d finished them. Only two months? Dude.. I have socks that are on 6 months for just the first one! Congrats, they’re gorgeous! those turned out so beautifully! and I admit, there was some swooning at the sight of knitting under May, but not to worry, Em jumped up and roused me from my faint. The color change of your hand dyed yarn is fabulous!